9/10/2016–RALEIGH, NC–You have been dreaming of becoming a pilot since you were six years old. Always wondering what it was like to be the pilot in control of the airplane. Then, as a teenager, you are now realizing those dreams. That is exactly what is happening for Cadet Captain Joshua Thompson of the Raleigh Wake Composite Squadron of the Civil Air Patrol. 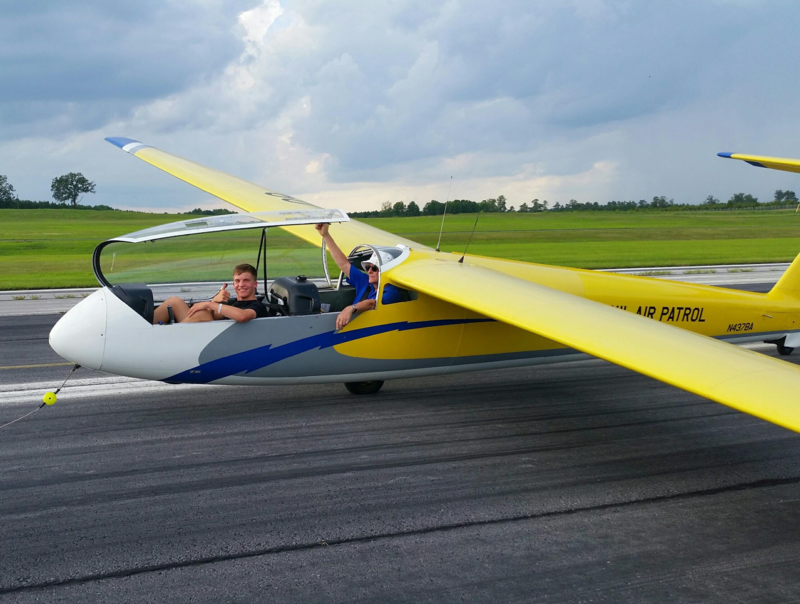 He was the first cadet in the North Carolina Wing to complete his form 5 in the glider on August 20, 2016. When he was six years old, one of his Dad’s best friends took the two of them flying in his Cirrus SR-22. C/Capt Joshua Thompson was hooked on flying from that day on and still loves to fly just like he did on that first flight. He joined Civil Air Patrol after hearing about the organization and the opportunities he would have to fly as a cadet. 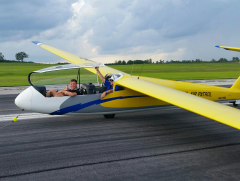 When he received his first cadet orientation ride in 2013, he knew he wanted to learn how to fly the glider too. “I enjoyed that flight so much that I decided to pursue powerless flight. I owe CAP big time for that!,” stated Cadet Thompson. When he was able to, he attended the 2015 Middle East Region National Flight Academy Powered at Ft. Picket Army National Guard Base, Virginia. C/Capt Thompson received one of Civil Air Patrol's full ride scholarships. This allowed him to complete his private pilot’s license in a powered aircraft in Raleigh, North Carolina. He had to wait until his 17th birthday to complete the program, earning his powered pilot license in early June. The glider add-on was completed up in Vermont at the end of the month and he has flown the CAP Merlin several times prior to flying his form 5. Captain John Styers of the Franklin County Composite Squadron gave him his form 5 check ride in the glider. The same one Cadet Thompson received his first glider orientation ride in. Cadet Thompson’s advice to any cadets wishing to obtain their glider license is to start reading the glider pilot’s handbook. The handbook has a lot of knowledge that you will use all the time during your soaring flights. Take advantage of what CAP has to offer. Take all of your powered and glider O-flights, sign up for multiple glider academies, join a soaring club and you will become qualified for a rating before you even know it. When asked what his future goals are in both his personal life and CAP, he stated that he wanted to become a commercial airline pilot with a major airline. In CAP, he wants to become involved as much as possible in aerospace operations. Cadet Thompson's plans include obtaining his Mission Pilot rating, tow pilot rating, CAP instructor rating and a cadet orientation pilot. One of his other goals is to build his own kit aircraft. His favorite is a Vans RV-7. Because of his parents, the mentors and CAP senior leaders Cadet Thompson has had, there is no doubt that he is going to achieve his dreams and goals. Civil Air Patrol has another outstanding cadet who will be a future leader in the organization.